Postage stamps - I love them. In the UK, we have two different types of stamp in general use. Commemoratives which are issued every other month or so and as their name suggests are used to commemorate important events and anniversaries and Definitives. These stamps are the regular every-day stamps issued in a variety of different values so that any combination of postage can be made up from them. They are also known as Machin stamps after the artist who originally designed the queen's side view portrait used on them. Since they first appeared they have been issued in a huge variety of colours and I have always been very attracted to them for use in mosaics and papier mache. 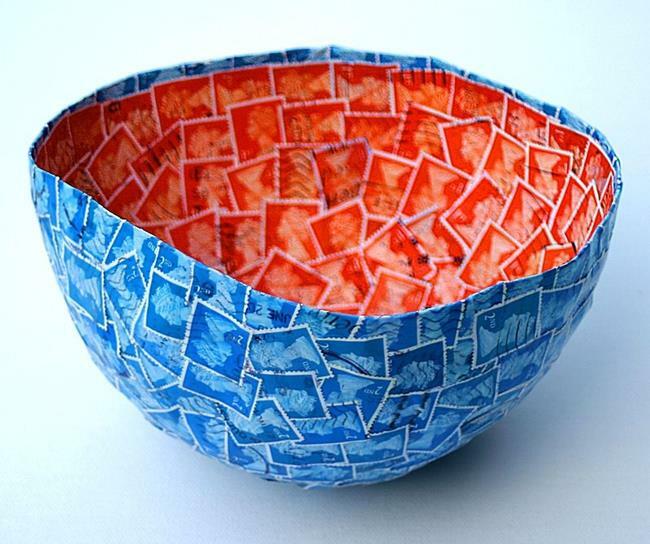 This bowl is a papier mache base of old newspapers and glue in several layers for added strength. 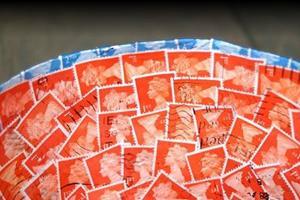 The final decorative layer is made from orange 1st class stamps and blue 2nd class stamps. I saved these from letters I've received over many months. 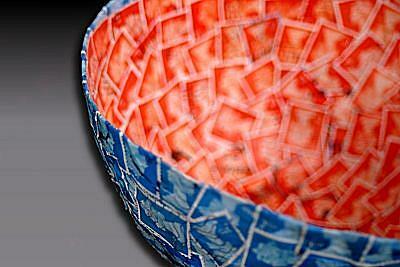 All the stamps were soaked off the envelopes and applied to the bowl in an overlapping layer. The final dimensions are approx 7" diameter around the rim and it stands about 5" tall. The bowl is not dishwasher safe - obviously, but it is lovely for storing scraps of wool or paper, arty bits or even used stamps being saved to make another bowl. I think I might try a black and red one next. That would be the 20p and the 44p stamps. Chuckle!